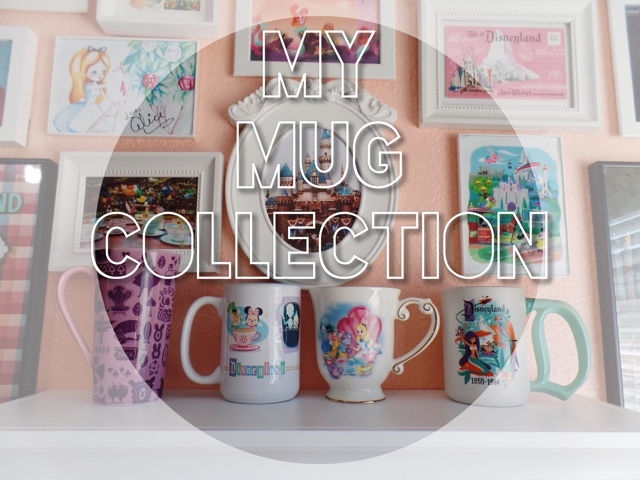 I have decided that I am going to start a new series on my blog which will include me sharing my small mug collection that mainly consists of Disney mugs. Every couple of weeks or so I will be sharing different mugs that I own. I did not come up with the original idea of this series, I got the idea from my good friend Imelda who started sharing her mug collection on her blog a couple months back. I loved reading her posts about all her mugs and I had asked on my Instagram if anyone would be interested for me to begin this series on my blog. I'm very happy that a good amount of you said Yes! I don't have an enormous collection but regardless this still will be fun to share. The first mug I'm sharing, I believe is also the very first mug I purchased from Disneyland. This is my favorite Alice mug that I own, and it is the Disney Parks Alice in Wonderland Mad Tea Party mug. It has a very vintage feel to it which I adore. In the front and back of the mug it has one of the most famous scenes of the movie with Alice, Mr. Hatter and the March Hare sitting at the table during a mad tea party. 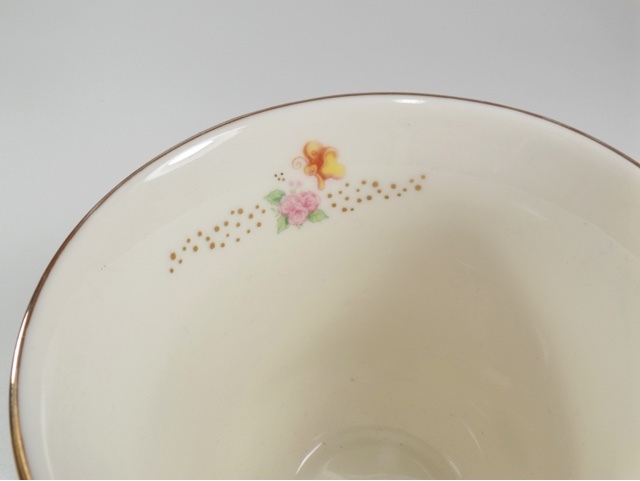 Along the edges of the mug there is golden accents and if you peek in the inside you will find a Breadbutterfly in the inner lip. I love how sweet a lot of the characters of this movie look especially the Breadbutterflies, and I always smile whenever I look inside this mug and see it inside. Just a quick heads up, you will see that 95% of my mugs are Alice in Wonderland mugs. 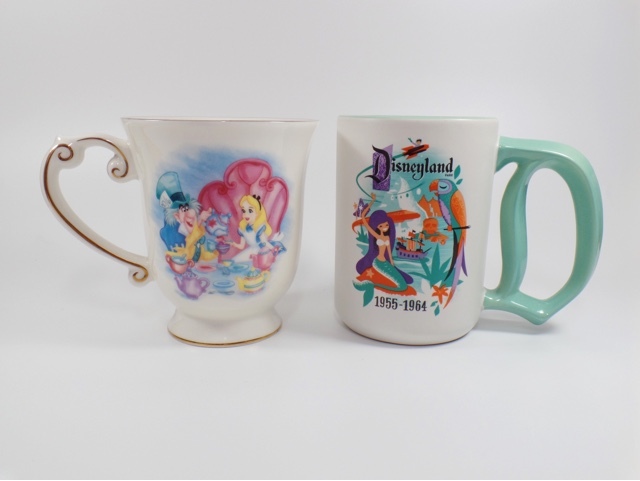 The following mug is the Disneyland 60th Diamond Celebration Decades 1955-1964 Mermaid Lagoon Tiki Limited Edition mug illustrated by Jeff Granito. When I first seen a photo of this mug on IG once Disneyland began sharing their Diamond celebration merchandise I knew I needed this mug. I love mermaids just like every other girl but once again this mug has a vintage feel from the 50's which has always been an era I've been obsessed with. I love everything about this illustration because it contains a little bit of everything; mermaid from the blue lagoon, parrot from the tiki room, pirate ship along with skull rock, and the Matterhorn. Of course it being partially mint was another reason why I loved it since it's one of my favorite colors. I really like how the handle of this mug is shaped as a D for Disneyland. This mug was limited edition and sold out almost immediately. I had gone to Disneyland multiple times in search for it and they never had it in stock. Then one lucky day on one of my trips to Disney I was browsing around one of the shops and saw that they had a very small amount of this mug on the shelf. Of course I quickly grabbed it and purchased it right there and then. I am so happy to have this mug because it is a special souvenir for a couple of reasons. One being that I was able to be at Disneyland to celebrate and experience their 60th anniversary and during their kick off weekend Rudy asked me to marry him. Next is this super adorable Disneyland Resort Mickey and Friends mug. This mug is filled of cuteness overload from the pretty pastel colors along with all the adorable characters around it. I spoke a little about this mug on My Disney Home video that I included on my blog post, there I even mentioned how one of the reasons I purchased this was because of Minnie and the Mad Hatter on the tea cup. 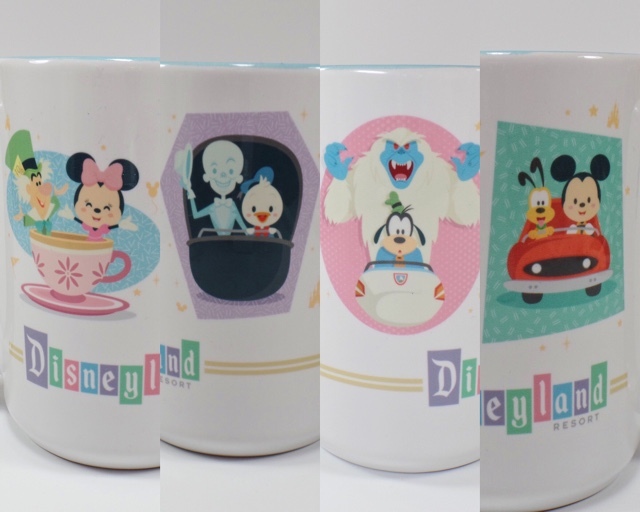 This mug also includes Mickey with Pluto, Goofy with the Yeti, and Donald with the Hitchhiking Ghost. Around all the characters there is gold images of a Mickey shaped balloon, stars, Mickey shaped hat and Sleeping Beauty's castle. 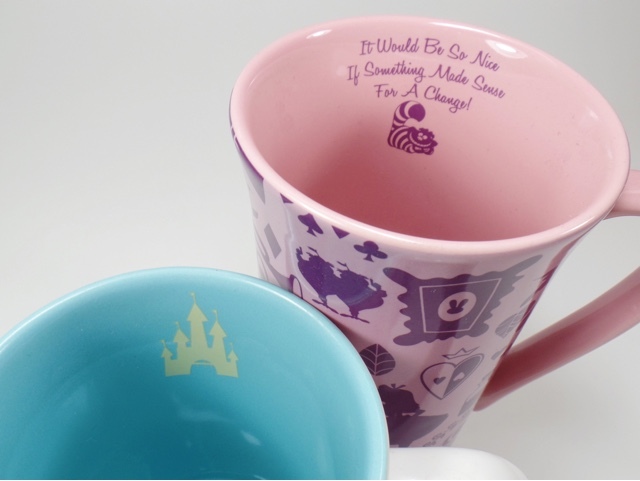 Another surprise you may find is inside the mug there is Sleeping Beauty's castle on the inner lip. This mug was created especially for Disneyland. For the last mug I'm sharing is another Alice in Wonderland mug. This mug I purchased at the Disney Store sometime last year I think, and I'm not sure what it was called. This is more on the latter side which is nice for mornings when you're in need of extra coffee. This cup is filled of different silhouettes from the animated film. You can find two Alice one of her standing and the other of her sitting down, different signs saying back and that way, Mr. Hatter's hat, the cheshire cat, tulips, the tweedles and so much more! This is definitely a fun mug with everything that is going on. This mug also has a picture of the Cheshire Cat in the inner lip with the quote "It would be so nice if something made sense for a change!" I don't know why but I love it when mugs have a hidden surprise inside. This is where I end part one of my mug collection. I hope you enjoyed and come back for part two! 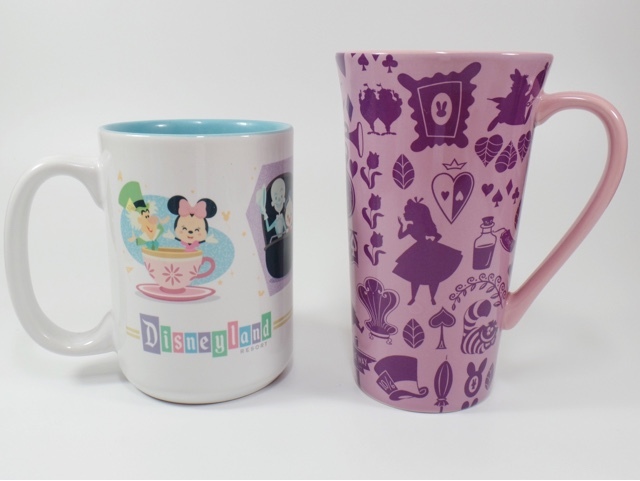 I had a lot of fun with this post and brought back memories to when I purchased these mugs and why along with what I liked about each of them. I totally regret not getting the Mermaid Lagoon mug. It's so cute and it would of match my kitchen. P.S loving your mug series! Thank you, your series really got me inspired! The mer maid mug is a favorite of mine I really hate how quick some things at Disney sell out. It would have been perfect in your kitchen!